NORTH CHARLESTON, S.C. — The mutually beneficial campaign detente between Donald Trump and Sen. Ted Cruz (Tex.) came to an end on the debate stage here Thursday. 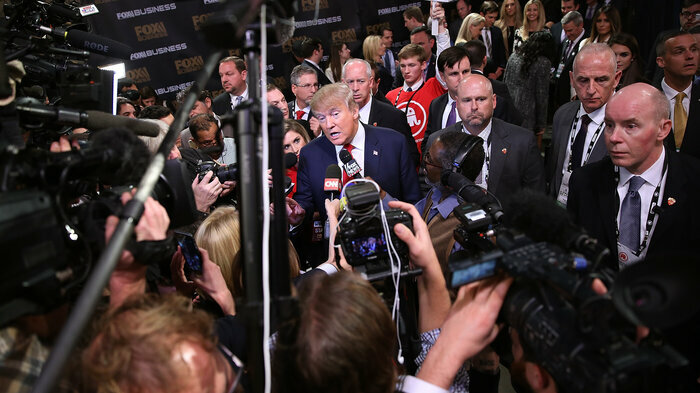 Donald Trump, Republican front-running for the 2016 nomination for president, talks with reporters in the spin room following Thursday's Republican debate about his contentious exchanges with Ted Cruz, including standing up for Ted Cruz and emphasizing uncertainty about Cruz's qualification to be president. Theirs was far from the only battle that broke out in the sixth GOP debate of the 2016 campaign season. Sen. Marco Rubio (Fla.) had intensely personal clashes with both Cruz and New Jersey Gov. Chris Christie. Rubio and Christie are both hoping to emerge from the crowded Republican field as the establishment’s champion against the forces of insurgency that Trump and Cruz represent. Until recently, it was in both Trump’s and Cruz’s interest to avoid a direct confrontation. Cruz was leery of alienating Trump’s supporters — who might come to him, if the incendiary billionaire were to self-destruct. Trump, for his part, did not consider Cruz much of a threat. On Thursday, they went so far as to question each other’s fitness to govern. Trump contended that Cruz’s birth to a U.S. citizen in Canada might disqualify him from becoming president because the Constitution decrees that only a “natural born citizen” may hold the office. “There’s a big question mark on your head. And you can’t do that to the party. You really can’t,” Trump told Cruz. The senator from Texas retorted that Trump was motivated more by his political prospects than any constitutional concern. Then it was Cruz’s turn to go on offense. Repeating something he first said in a radio interview, Cruz charged that Trump had “New York values” — invoking that city’s reputation, particularly in red-state America, as the bastion of the liberal elite. Trump responded with indignation, saying New York City is home to “loving people, wonderful people.” He recalled the fall of the World Trade Center towers on Sept. 11, 2001, noting the “smell of death” that pervaded the city for months. However, when Rubio and Cruz got their chance to go at it, theirs turned out to be an esoteric back-and-forth over the consistency of their Senate votes, particularly on immigration. The disputes that broke out during the debate, which was sponsored by Fox Business Network and included the GOP’s seven leading presidential hopefuls, have been simmering on the campaign trail in recent days. The event gave the candidates a chance to confront one another face to face, rather than through their stump speeches, surrogates and allied super PACs. Among the Republicans, several battles are going on at once. Where Trump and Cruz are each looking to win the caucuses by claiming to be the one who can slay the old order, the field also includes a host of current and former governors and senators. Rubio repeated his charge that Christie, the governor of a heavily Democratic state, has a record too liberal for a conservative party. He noted that Christie once supported Common Core educational standards, backed some gun-control legislation and supported Obama’s nomination of Supreme Court Justice Sonia Sotomayor. Christie recalled October’s debate, when Rubio responded to an attack from Bush by saying someone had convinced him that Bush had to hit his onetime protege. “It appears that the same someone who has been whispering in old Marco’s ear, too,” Christie said. As the leading candidates feuded, Ben Carson — the mild-mannered retired neurosurgeon who briefly topped the polls — urged civility. “We have to stop this because, you know, if we manage to damage ourselves and we lose the next election and a progressive gets in there and they get two or three Supreme Court picks, this nation is over as we know it,” he said. The call did not stop Bush from going after Trump, describing his rival as “unhinged” for his policies on immigration and Muslims and misguided in his plans for high tariffs on Chinese imports. “This would be devastating for our economy. We need somebody with a steady hand being president of the United States,” Bush said. Trump responded with an attack on Bush’s personality. The debate came just 48 hours after President Obama delivered the final State of the Union address of his presidency, which included sharp condemnation of the angry GOP rhetoric over Muslims, immigration and other issues. At the debate, the candidates flung zinger after zinger in an attempt to outdo one another in delivering the most visceral condemnation of both Obama and Clinton, his first-term secretary of state and the leading Democratic presidential candidate. Christie called Obama “a petulant child” and likened his State of the Union to “storytime” because it painted, in Christie’s view, too rosy a picture of the country. “We are going to kick your rear end out of the White House come this fall,” Christie said of Obama. Although Ohio Gov. John Kasich did not figure in the more contentious exchanges, he sought to appeal directly to frustrated middle- and working-class families. David A. Fahrenthold in Washington contributed to this report.